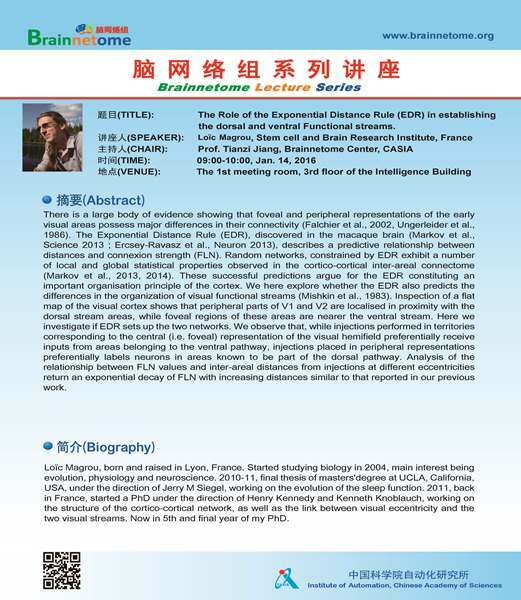 Title: The Role of the Exponential Distance Rule (EDR) in establishing the dorsal and ventral Functional streams. There is a large body of evidence showing that foveal and peripheral representations of the early visual areas possess major differences in their connectivity (Falchier et al., 2002, Ungerleider et al., 1986). The Exponential Distance Rule (EDR), discovered in the macaque brain (Markov et al., Science 2013 ; Ercsey-Ravasz et al., Neuron 2013), describes a predictive relationship between distances and connexion strength (FLN). Random networks, constrained by EDR exhibit a number of local and global statistical properties observed in the cortico-cortical inter-areal connectome (Markov et al., 2013, 2014). These successful predictions argue for the EDR constituting an important organisation principle of the cortex. We here explore whether the EDR also predicts the differences in the organization of visual functional streams (Mishkin et al., 1983). Inspection of a flat map of the visual cortex shows that peripheral parts of V1 and V2 are localised in proximity with the dorsal stream areas, while foveal regions of these areas are nearer the ventral stream. Here we investigate if EDR sets up the two networks. We observe that, while injections performed in territories corresponding to the central (i.e. foveal) representation of the visual hemifield preferentially receive inputs from areas belonging to the ventral pathway, injections placed in peripheral representations preferentially labels neurons in areas known to be part of the dorsal pathway. Analysis of the relationship between FLN values and inter-areal distances from injections at different eccentricities return an exponential decay of FLN with increasing distances similar to that reported in our previous work. Loïc Magrou, born and raised in Lyon, France. Started studying biology in 2004, main interest being evolution, physiology and neuroscience. 2010-11, final thesis of masters'degree at UCLA, California, USA, under the direction of Jerry M Siegel, working on the evolution of the sleep function. 2011, back in France, started a PhD under the direction of Henry Kennedy and Kenneth Knoblauch, working on the structure of the cortico-cortical network, as well as the link between visual eccentricity and the two visual streams. Now in 5th and final year of my PhD.